This issue’s article (at the end of the newsletter) is an inspiring account, by Virgilio Y. Prudente, of upcoming events in the Philippines. This Conference is from 23rd - 25th August 2018 at RV College of Engineering, Bengaluru, India. There will be scholarly speakers presenting their research and many workshops for students and teachers. Details can be seen at the link below, and registrations are now being taken. The research papers from this conference in December 2017 at St Stephen’s College, New Delhi, can be requested after paying a $10 donation. 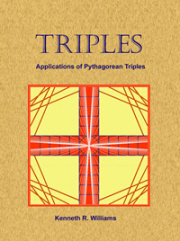 While studying Pythagorean Triples, I came across an article about two consecutive odd (or even) numbers being the basis for the lengths of the sides of right triangles. The sum of these numbers would be one of the legs of a right triangle, and their product would be the other leg. Out of curiosity, I tried to prove it to myself. I was momentarily stumped. How can I extract the square root of that expression? I said “momentarily”, because I immediately remembered the Vedic sutras. Using “The First by the First”, the square root of x4 is x2. We need only to determine the value of B. By using “The Product of the Sums is the Sum of the Product” we know that the digit sum of the hypotenuse is the square root of the digit sum of C2. The digit sum of C2 is 1 + 4 + 8 + 8 + 4 = 25 and the square root of 25 is 5. (1 + B + 2) must be 5, then B = 2. The hypotenuse is thus (x2 + 2x + 2) or just 2 more than the other leg. This book presents direct, immediate and easily understood proofs. These proofs are based on only one assumption (that magnitudes are unchanged by motion) and three additional provisions (a means of drawing figures, the language used and the ability to recognise valid reasoning). Starting from these first principles it leads to theorems on elementary properties of circles. It includes discussion on the relevant philosophy of mathematics and is written both for mathematicians and for a wider audience. will increase at the end of August 2018. The prices have not been increased since the Bookstore was originally formed but due to increasing costs of printing and postage it is no longer possible to sustain the current prices. Quezon City, Metro Manila on August 9. Separate sessions for students of all ages are also scheduled. A teacher’s handbook, also entitled “Inspirational Maths from India,” was specially written for this occasion by IAVM members and will be given to the participants. It contains topics that will be discussed in the seminars. A total of 500 teachers and 2,000 students are expected to attend the seminar series organized by MATH-Inic Philippines in cooperation with the Palawan State University, Department of Education, Division of San Pablo City, and the World of Outbound. Among the main sponsors are Palawan Pawnshop-Express Pera Padala and the City Government of San Pablo City. Upon the request of the College of Teacher Education of Palawan State University (PSU), the IAVM sent a “Proposal of Cooperation for the Introduction and Maintenance of Vedic Mathematics into the Curriculum of the Philippines.” A Memorandum of Agreement to be signed by the PSU, IAVM, the Vedic Mathematics Academy, and Vedic Maths Inc. is currently in the works. The Division of Schools, San Pablo City is considering a similar agreement. These partnerships will help popularize VM in the Philippines and is a step towards strengthening Math skills in the country. The Institute for the Advancement of Vedic Mathematics (IAVM) Chair and co-founder James T. Glover will be the closing plenary speaker at the 2018 Mathematics Teacher’s Association of the Philippines – Tertiary Level on July 27 at the Cebu Grand Hotel, Cebu City. He will talk about “Vedic Maths as a Pedagogical Tool “, a paper co-authored by Mr. Glover and Vedic Mathematics Academy founder Kenneth R. Williams in 2015. IAVM member and MATH-Inic Philippines president, Virgilio Y. Prudente will also discuss the “Various Applications of The First and Last Digits and Digit sums in Arithmetic and Algebra” during the closing plenary session. A Speed Math contest sponsored by Math-Inic Philippines will highlight the closing ceremonies of the convention. One hundred thirty Filipino elementary and high school teachers are currently enrolled in the Vedic Mathematics Teacher Training Course under Vedic Maths Academy founder Kenneth R. Williams. Upon completion of the course, these teachers plan to organize training teams to introduce VM not only to their co-teachers in their localities but also to the other regions in the Philippines.